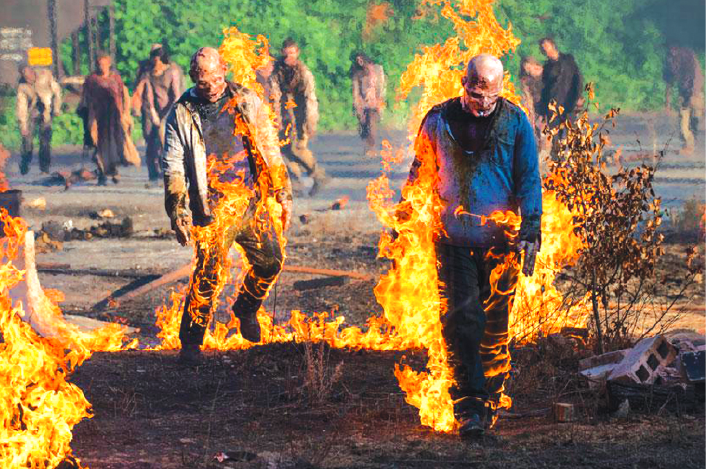 Scene from The Walking Dead, an Emmy nominated series that was supervised by special effects coordinator David Alexander. Alexander spoke to Artesia HS students in early September after an invitation from AHS teacher, Brian Rodriguez who runs the Video Production Program Department. Rodriguez was talking about Emmy nominated special effects mastermind David Alexander who held Artesia High School students captivated with his presentation in early September. Alexander is a Computer Graphics (CG) Supervisor and Lead 3D Artist at EntityFX.com. He is a Visual Effects Society (VES) Award-winning visual effects artist and supervisor with credits spanning television, commercials, and feature film. Across his career, Alexander has contributed to a wide range of productions including Michael Jackson’s This Is It, Law Abiding Citizen, Eastwick, Smallville, and The X-Files. He has also worked on Ghosts of Mars, Donnie Darko, Swordfish, Pirates of the Caribbean: The Curse of the Black Pearl, The Terminal, The Cat in the Hat, and Monarch of the Moon. David received a VES nomination in 2008 for his work on Smallville. He’s also the nephew of Dr. Alexander Khananashvili, founder of Activate Hawaiian Gardens program. This was the first in a series of presentations that Rodriquez says will offer invaluable insight to interested students. He was earnest in his speech, noting that it takes time, dedication and many years to become a success. He says he was actually traveling abroad when he received word that he had been nominated for an Emmy. The Emmy nomination was for The Walking Dead, Best Supporting Visual Effects, episode “No Way Out.” Alexander was the CG Supervisor. The popular AMC series received two wins and 15 nominations. This was his first Emmy nomination, receiving his first award from the VES for his work on Smallville. Alexander was accompanied to the awards ceremony by his mother and his cousin. The Creative Emmys were broadcast September 11, 2016. The ceremony is presented in recognition of creative, technical, visual, and other similar achievements in American television programming, including voice-over and guest acting roles.